Lest you think I have abandoned textiles entirely for a life of music and frivolity, here are a few photographs of some of the items I've been working on for the Craft Fair at Letheringsett this weekend. First the details - Back to the Garden can be found very easily on the main road from Fakenham to Holt, and all the details are on the website above. Come along for a visit, have coffee, a snack or lunch - and there is also a food festival on at the same time as the craft fair. As well as the bangles and pin-cushions, brooches and quilts, I have some new items, some of which I am rushing to finish! A woollen bag with felted wool appliqué decoration. A new cushion using some of my dyed blanket. 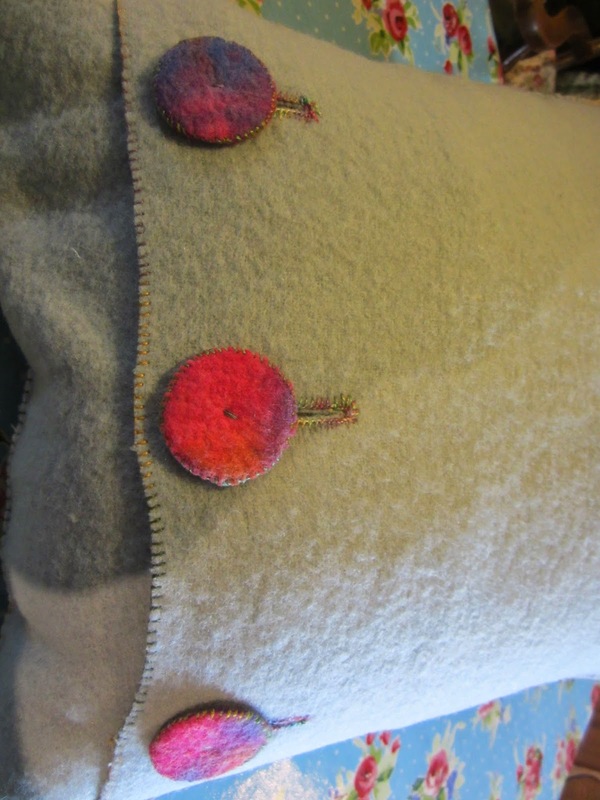 I made the buttons with felted wool and pelmet vilene. A fourth "One Bird Upon a Hill" cushion, they are proving to be very popular! Folk art blooms and birds on this third cushion. I made this little nursery cushion using reproduction "flour sack" fabrics, and the central panel contains a dozen genuine vintage Suffolk Puffs or "yo-yo's" as they are known in the States. And this is my latest Angel Panel, slightly smaller than the first one which has sold. I so enjoy designing and stitching these panels - more in the pipe-line, but not in time for the craft fair! It will be an early start on Saturday morning, though it is less than an hour's drive for me. I'm quite looking forward to it, and bless her cotton socks, Yvonne Autie rag-rug maker and silversmith extraordinaire, has volunteered to come and keep me company all day Saturday. I know several other friends have promised to pop up and see us, and I hope that my Norfolk blogging friends might be free to dash across-county and come and say hello. This is a new venue for North Norfolk Arts and Crafts, and I am very proud that Textile Treasury has been selected as one of the exhibitors, so do come along and help make it a success! ooh such lovely work. I love it all, especially the cute bag. I wish I was nearer and could come and see these lovely things for real. Good luck and hope the day goes well and you sell all your wonderful goodies. Hope it all goes well, having 'crafted' for quite a few years, know it can be a long day. I'm sure you will do well, love the angel panel. Thanks Dc, actually it is two days, but am hoping it will be busy - and profitable!! Your work is lovely Lynne! I love the pillow with yoyo's, so cute!! You should sell out!! Your work is beautiful Lynne , I'm wondering if we may be able to come along on Sunday? I'll try to if I can be excused cricket duties! Apparently the cricket is cancelled, fingers crossed I'm going to try to make it! Everything looks fabulous Lynne ... I hope sales are going well. I am in love with that grey bag, hope you did well. Thanks for visiting... I think I shall have to pinch your bag squares idea if that's OK? Brain picking time.... I love making squares of felt with designs on them; I have one with four small birds and want to do one copying your bag squares. But what to do with the squares themselves? I don't need more cushions, and had thought of some sort of wall hanging, but not sure how or what to attach them to... any ideas? The squares are ten inches.